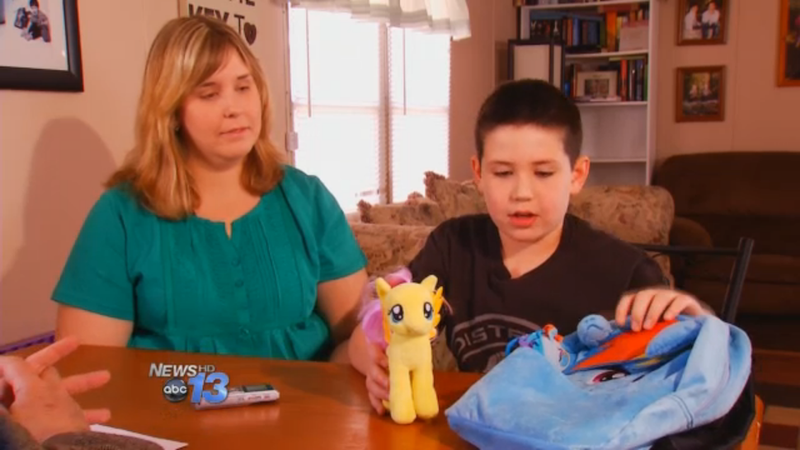 A 9-year-old North Carolina boy whose My Little Pony backpack were banned by his school because they were a "trigger for bullies" will be allowed to return with the bag, according to school district officials. Grayson Bruce and his parents complained to the school that he was being picked on and harassed by other children for liking "girls' toys." "They're taking it a little too far, with punching me, pushing me down, calling me horrible names, stuff that really shouldn't happen," Grayson said. The school asked him to leave the bag at home because it was a "distraction" that enticed bullies to beat him up. The school's misguided solution caused a public outrage—a Facebook support page created in Grayson's honor attracted 70,000 members, a Change.org petition received 11,000 signatures, and his story drew the attention and support of the Brony community. After meeting with Grayson's parents on Thursday, the Buncombe County School district posted a series of statements on its Facebook page. We sincerely regret that the issue of being told to leave the bookbag at home was perceived as blaming Grayson. While that was not the intent, the perception became reality. We support Grayson bringing the bookbag to school. We are considering all options for getting Grayson back in school. We are pleased the school system is working closely with us. All of the options include Grayson taking his "My Little Pony" bag to school. The Bruces told NBC that while the meeting with the superintendent went "very well" they are thinking of transferring their son to another elementary school.